Multifunctional Skin Care System InnoCell Vita Lux is designed for professional work in the beauty salon or facial room. Functions: ultrasonic; skin scrubber; high frequency; rotary brush; galvanic; vacuum/spray. 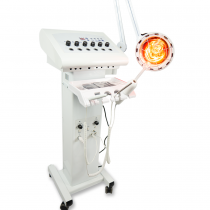 Multifunction facial machines are considered to be perfect equipment that every esthetician dreams about. 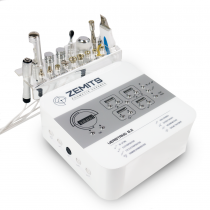 Multifunction facial equipment is specifically designed to provide salons and spas with all the tools and make all of the highly demanded beauty treatments available even in the smallest spaces. Beauty brands have embraced Multifunctional machines. Now, with the newest advancements in technology, some machines offer up to 15 different treatments. Ergonomically designed, these amazing machines let you offer any popular treatment to your clients having invested in just one machine. To stay in business, salons need to compete. You need to be able to stay on top of things, understand the needs of the market, combine different treatments to offer the best possible results and also try not to scare the clients away with prices per treatment. 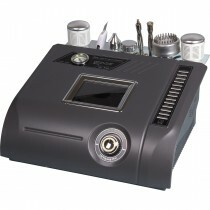 Multifunction esthetician machines give business owners freedom to do all of the above and more. Yes, there is a huge demand nowadays for Radiofrequency treatments, Ultrasound treatments, LED light therapy treatments, Galvanic treatments, Dermabrasion, Microdermabrasion, and others. You need to offer the hot and cold steam facials and relaxing aromatherapy, you need to mix and match to accommodate clients with different skin types, skin conditions, allergies and so on. Multifunction facial machines are here to save the day: with only one investment you can have all the latest trends in the palm of your hand. Research shows that clients feel taken care of and highly appreciate the investment, commitment and dedication that beauty business shown by investing in multifunctional machines. With multifunction esthetic machines, the business usually runs more smoothly. There is no need to move the client from chair to chair and absolutely no need to deny service because you haven’t had the chance to invest in yet another piece of equipment. You can easily book a client for a hot steam facial, microdermabrasion, and RF treatments and then offer to cool the skin down with cold mist and aromatherapy. No downtime. No need to move the client. Professionalism and the ability to take care of all the client’s needs are always greatly appreciated. They are huge time-savers. You can find Multifunctional Systems that offer five, eight, eleven and more different treatments. With no downtime, no need for dismantling, putting away, and no need to set up new equipment. Though very impressive, the design of multifunctional facial beauty machine is usually very ergonomic. A lot of estheticians have very limited space and are quite often restricted with available storage. Multifunctional machines will leave your professional workspace looking like a place where professional works. No mess, no clutter.